The celebration of the Centennial of the Apparitions of Fatima represents an opportunity for the Shrine of Fatima to undertake several projects which aim to emphasize the importance of the event, the message and the place. 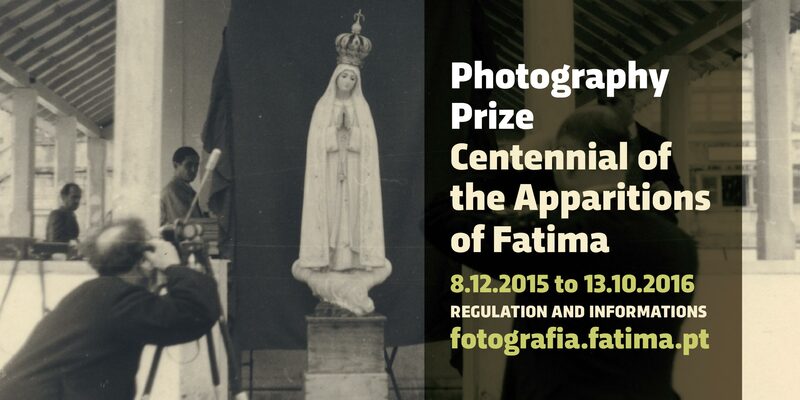 In this context, and taking into account the close relation between photography and Fatima in history and today, and the importance of this art in today’s world, the Shrine of Fatima launches the Photography Prize Centennial of the Apparitions of Fatima. The photographic works will fit into the categories Human Portrait, Landscape, Spirituality and Message: practices and rituals and Photo-narrative - photographers can submit works in all the categories. The photographic works will be rigorously evaluated by a jury of recognized value in the area. This project makes clear that the Shrine of Fatima is convinced that the photographic art will be, in particular by means of this Prize, a privileged and relevant tool for a fruitful hermeneutics of Fatima – semantically, artistically and contemporarily meaningful – as well as a tool that will contribute to the living and the celebration of this significant event that, from 2010 and throughout seven years of festivities, has been intensifying. Priest in the Diocese of Leiria-Fatima; doctorate in Liturgy from Sacred Scripture School at Pontifical Athenaeum St. Anselm, in Rome and professor at the Faculty of Theology of the Catholic University of Portugal. He is the Rector of the Shrine of Fatima since June 11, 2011. He earned his Doctorate in Art History at the Faculty of Letters of the University of Coimbra. He is the director of the Studies and Diffusion Department of the Shrine of Fatima, and of the Museum of this institution. He is also the director of the Department of Cultural Heritage of the diocese of Leiria-Fatima. He has deepened his studies of Iconography and Iconology, areas which are related to the ancient and contemporary sacred art. He has a degree in Architecture and is an architectural photographer. He was pioneer in the way of taking photographs of architecture and of transmitting it. He and his brother broaden much of the Portuguese contemporary architecture in the last fifteen years. His works are frequently published in several national and international publications. He collaborates with several Portuguese and foreign architects of renowned reputation. His career began as a journalist in the Portuguese newspaper Jornal de Notícias, but decided to follow the area of photojournalism, in which he became a major figure. He works, for more than three decades, with the newspaper Expresso, of which he was director of photography, editor and main reporter. He is the author of many articles in almost hundred countries; he has edited numerous books and collaborated in others. All these activities are developed along with his educational work. Inês d’Orey has a degree in Photography from the London College of Printing and in International Relations from the University of Minho. She works as a freelance photographer, for private clients and public institutions and develops personal projects in photography area. She won the FNAC New Talent Prize in photography in 2007. She publishes frequently and exhibits her work in Portugal and abroad. Paulo Catrica studied Photography at Ar.Co., an art school in Lisbon. He has a degree in History at the University Lusíada, in Lisbon and received a Master in Image and Communication from Goldsmith’s College in London and a Photography Doctorate from the University of Westminster. His work is regularly exhibited and published in Portugal and abroad. His recent works focus the different aspects of urban photography and landscape photography. He obtained a Master Degree in Applied Photography; he teaches in several institutions, mainly at the Polytechnic Institute of Tomar, which he has cofounded and has headed. In the area of photography, his work can be found in several official and private collections in Portugal and abroad, as well as in books and publications; he participates also in exhibitions and collective projects. Considering the importance of photography as an art that is inseparable from the contemporary world and recognizing its historical and umbilical connection to Fatima, the Shrine of Our Lady of the Rosary of Fatima opens the “Photography Award Centennial of the Apparitions of Fatima” with the Centennial of the Apparitions of Fatima on the horizon. 1. The contest is open to professional and amateur photographers of any nationality. 2. The members of the jury and the official photographers of the Shrine are not eligible. 3. Each participant can compete in all categories, with a maximum of 2 (two) photographic works in each category; each work must comply the presentation requirements identified in this regulation. 1. The photographic works must be in digital format which must be presented in a flash drive, CD or DVD, inside a closed envelope mentioning the pseudonym and the category. This envelope must enclose another closed envelope identified with the same pseudonym; this one must comprise the identification of the author (full name, address, e-mail and telephone or mobile number). 2. Support Characteristics: files in RGB, with a minimum of 3500 pixels on the long side, 300 dpi resolution, in JPG format with compression 8 (from 0 to 12) and no larger than 3 MB. 4. The Shrine will not acknowledge receipt of entries. 5. The entries will be opened by a committee named by the jury’s president, which will have at least one element of the Apparitions of Fatima Centennial Committee and another element of the jury. This committee will prepare the evaluation works and number each application, and guarantee that the author’s name will not be known before the identification opening, which will happened after the photographic works selection. 1. The photographs must have been taken within December 8, 2015 and October 13, 2016. The first emergency aid unit. 3. The photographs cannot be manipulated, except the normal treatment, framing, color adjustment, density and contrast. 4. The author may add captions. 5. The author may add written description. 6. Each participant must be able to provide the photographs original in case the jury planned to analyze them. 1. The submission of entries must be done until October 31, 2016. 2. The jury’s deliberation will be known on November 26, 2016 (presentation of the annual theme of the Shrine) and online in the official website of the Shrine of Fatima. 3. The authors can use their submitted works only after October 13, 2017. A) Human Portrait. No matter the time spent, the faces that inhabit the Shrine of Fatima are numerous: residents and pilgrims, tourists and outsiders and so many others protagonists of the human portrait feature the Shrine of Fatima and feature themselves by the place they explore and that one photograph can live it on. B) Landscape. The permanent event scenario of “Fatima”, build or natural, is also an image-protagonist that makes the field of action and gives itself over to many reinterpretations. D) Photo-narrative. The succession of images which form a narrative will set, of Fatima, living contents in moments perhaps more extended in time. Each work in the photo-narrative category must comprise 6 to 13 photographs, a title of 100 characters maximum and a framing text of 500 to 800 characters. 1. A prize of 1000,00 € (one thousand euros) will be awarded in each category. 2. The best work in all categories, including those of the category D) of the Article 6th, will be awarded with the prize “Photography of the Centennial of the Apparitions”, of 2500,00 € (two thousand and five hundred euros). The value of this prize covers the category prize to which the photograph work was submitted. 3. The jury will select the best submitted works in order to expose and publish them. 4. The jury reserves the right not to award the prizes if the quality of the works submitted in the con- test is not judged to be sufficient. The Rector of the Shrine of Fatima or someone from the Shrine entitled by him. 2. The jury is presided by the Rector of the Shrine of Fatima or by someone entitled by him. 3. The jury can deliberate in the presence of 5 of its members. 4. The jury deliberates by simple majority of votes of its members with total independence and criteria freedom. A photographic work has to collect at least 4 (four) votes to win a prize. The jury’s President has the quality vote in case of a tie. 5. The jury’s members will not reveal any information acquired in the execution of their duties. A minute will be drawn up from every meeting of the jury and signed by all members. 6. The jury’s decision is without appeal. 2. If the photograph content so requires, the candidate has to guarantee that the proper and legal authorizations, for the contest purpose, have been obtained, from the legally entitled holders, regarding their intellectual or personality rights as well as image and private life rights, as for, taking full responsibility, namely any damages or losses that may cause harm or impairment to the contest promoter due to the violation of any of those rights. To the Shrine of Our Lady of the Rosary of Fatima, the contest promoter, are acknowledged, in the present regulation terms, the rights of use of the prize-winning photographs in the context of this contest, considering appropriate counterpart the value of the given prize in the terms of the present regulation. The Promoter can so, yet in a non-exclusive way, use the prize-winning photographs with no time, space or means limits, either by the promoter itself or through a third party, including, reproducing them, exposing them, including them in other works, independently of its support form, v.g., catalogues or books for distribution and marketing, to create other works from them, inform them to the public, diffuse and disseminate them to promotional and other ends, to place them at the public disposal by wire or wireless means, so that the pictures can be accessible to any person locally and at any time, involving so, all forms of digital communication. Respect for the paternity rights of the pictures, always mentioning its authors in every public communication act or any other use of the same. Impossibility to make changes, except when previously authorized in writing, by its authors. From the gathering of the non-winning photographs, the Shrine of Fatima will, in the terms of the present initiative, conduct a selection for possible expositions events (expected to itinerate) and eventual editing and publishing of a photographic catalogue, in which case the authors will be opportunely contacted in order of an agreement over the required authorizations for the pictures use. Any omissions in this regulation will be evaluated and solved by the Apparition of Fatima Centennial Committee. This English translation is provided for information. The original Portuguese version is the only valid version.